Elifar has secured six charity places in The Prudential RideLondon-Surrey 100. 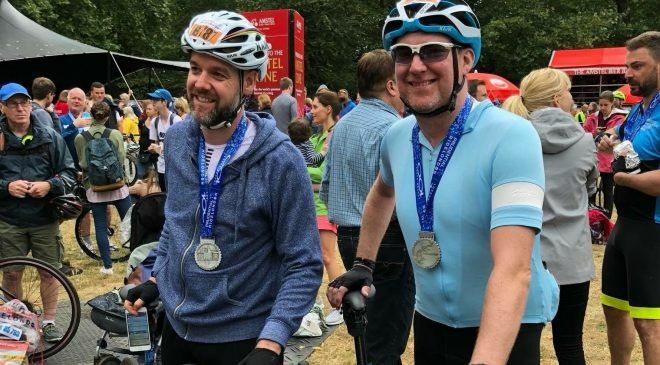 The spectacular 100 mile cycling event on closed roads through the capital and Surrey’s stunning countryside begins at the Queen Elizabeth Olympic Park and finishes on The Mall in central London. Our riders had a great time in last year’s event and raised significant funds for Elifar. Places on the ride are in high demand and we are now offering the opportunity for keen cyclists to take up our six charity places. We ask each of our riders to pay a small entry fee and pledge to raise a minimum of £350 to support our work with disabled children and young adults.